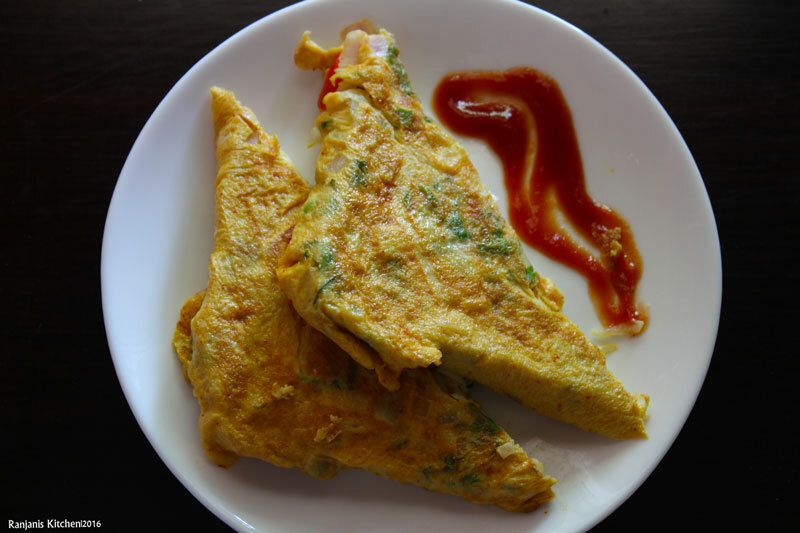 Bread Omelette recipe – Easy breakfast recipe to make.You can serve as evening snack also with tea or coffee. All ages will love It for sure and ready to eat every day. You don’t need much time to make this bread omelette. If you have needed ingredients in the pantry, you will finish it in 10 minutes. In a bowl, mix red chili powder, salt,turmeric powder with little water. Mix everything well. Break eggs and add to the spice mixture. Beat well till it incorporates with the spices. Add chopped onions, coriander leaves, chopped tomatoes, and green chilies. Heat dosa pan or tawa, plain toast bread on both sides till the bread slightly turns its color. Do the same for four pieces of bread and keep aside on a plate. In the same pan, drizzle some oil and pour some egg mixture. Dip one side of toasted bread and flip on another side. Cover sides with omelette as in picture and cook and both sides. Serve with tomato ketchup or green chutney. chop onions, tomato, green chili and coriander leaves. Mix the spices red chili powder, turmeric powder and slat with little water. Break and add 3 eggs into the mixture and beat well. Then add chopped veggies to it and mix well. Dry toast bread in tawa on both side till it turns light brown. Drizzle some ghee on the same tawa. Pour some egg mixture and place bread on it. dip on one side and flip on another side. Cover the bread with omelette and cook on both sides. Thanks to you… It’s so easy to understand the way you explain. So useful.